Another Oliver Edwards’ Pattern from my references, a POPA Caddis, an imitation of a fly returning to the stream, diving and laying eggs onto the stream bed. It is simple and it should remain simple. My other recommendation, remember that this hook rides up, so tie the under-belly colour on the outer radius. I usually do not tie blue and yellow, as illustrated, but good combinations are Dark-Green/Light-Green, Black/Any-Colour, Green/Yellow. I would think two-tone browns and olives would also work, but have not tried it. As far as materials, I use Wool, Antron and Synthetic Floss, typically on a Size 8 Deep Curve Hook, such as a Partridge Czech 8 Hook, as shown above. Just remember, the colour of your body will change when it gets wet, so test your materials underwater, before you tie a dozen. Experiement with wire ribbing and the fullness (thickness) of the woven yarn. You can add weight, but you must have a smooth underbody. And the best way to learn how to tie this nymph, the Oliver Edwards DVD, as referenced below, and practice. Including, especially, tieing off at the heat. Keep it simple. The head is a combination of deer hair and beads on a monofilament tag (with a burnt end). I do use pink and yellow beads too, but I do gravitate to a two tone green head. Keep the head and legs on top. Keep the body in front of the point. Taper the underbody with thread. 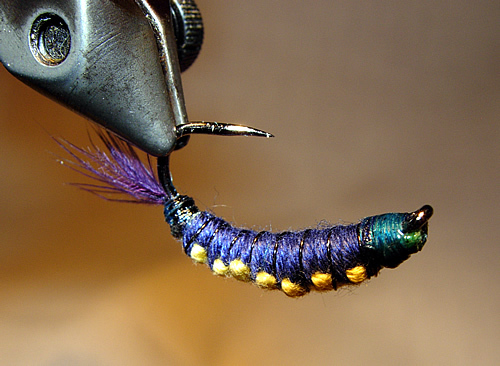 I often use glue on the body (tacky) to secure the peacock herl, but you can also use wire to re-enforce the herl. As illustrated in Oliver Edwards’ Masterclass book, the Peeping Caddis is a general recipe and variations are only limited by your imagination and effort. Change the colour of the body, the material, the head colour, et cetera. My only added advice, after examing the many cased bodies in the river, keep the body thin with a taper to the nymph’s rear. Slight Curved Hook, such as a TMC 200R (straight is okay). At Hook Bend, used Burnt Mono to hold 2 Small Beads for a head (above and behind the hook). Add Deer Hair for Legs. Using Thread, create a taper body, down to the hook eye. Create a body using Peacock Herl. You may use glue as an underbody, thread, mono or copper ribbing to make the body more robust. Ian James’ Crunchy Caddis has a substantial body, and thus slower to get to the bottom, it is often used in slower shallow water for trout, or with added weight. Once you done these, look to Oliver Edwards’ Dry Caddis and Popa Caddis, and with a Polish-Czech nymph, you have this family of insects covered. You will find Whitlock’s pattern reference in many locations and books, but go to the previousily mention book, Dave Hughes’ Wet Flies and forward to the colour plates to see a pattern from the master himself. Note, this book has a Whitlock fly, but does not really discuss how to dress it, the closest is the Gold-Ribbed Hare’s Ear. As an aside, Kaufmann’s instructions over dresses this fly (as well as the Hare’s Ear), IMHO. I tie in the round, in other words, no up or down, no wingcase. I view this as a general pattern you can adapt, change the colours and ribbing, as you see fit. The magic? Having a squirrel skin with abundant guard hairs. Any challenges? Squirrel dubbing is not regularly carried and I have found over the years the colours are very inconsistent, the quality is inconsistent including guard hairs and lately some had added in synthetics. (Kaufmann went from first choice to last place with this change). Squirrel in the abdomen is nice, but not critical and so I suggest, use your preferred nymph dubbing for the abdomen. The important part is a full squirrel skin with lots of guard hairs, for the tail and in the thorax. Hook: Refer to previous post on Nymph Hooks. The above fly is on a TMC 5263-12. Weight: Underweight if any, we want a slim abdomen. Thread” Your choice, for me, either black, red or on a whimsy blue. Tail: From a squirrel skin, with fur removed. Abdomen: Fine and thin dubbing. Rib: Fine wire of your choosing … I tend to black or copper. Thorax: Use a dubbing loop, contrasting dubbing and from the skin, more guard hairs. Head: Bead, if you wish, but of course you need to add it at the start. Anything more worthy of repeating or adding. As above, I note that many ties are too thick, keep the Abdomen thin. I buy my squirrel skin on sight, hard given the limited resources near me, but you want a skin with lots of guard hairs, and it will last many-many flies. It is a general pattern, select colours as dictated by your waters – tan, brown, red-brown, black. Same holds true for size, select hooks as dictated by your waters. Given the fly thorax traps air, a good thing, I may add a little split shot 6″ up the leader. The smallest versions (3399-16), maybe a dropper below a bouyant dry. I fish for panfish, trout, bass, pike, steelhead and salmon, depending upon season and availability. So I have a diverse collection of gear and flies. I started this blog about nymphs, an important fly for trout and winter steelhead, so lets return to nymphs. Earlier, I discussed standard (straight, down-eyed) nymph hooks and listed my standard nymph hooks. These standards are based on actual effective length of body, relative to gap and strength, and not an arbitrary hook number and size. When you select a hook, it should be based on the size and hooking ability of the eventual fly, not a manufacturer, model or size of a hook. Now, lets list the best reference tools, the information tools, I used to develop my skills for tying nymphs. Of course, I put this list out there, as a suggestion-recommendation for you, either beginner or advance. The Popa Caddis, okay 5 flies! Read everything and tie it all. Tying small teaches you about thread and thread control, which is so important. I suggest you do use a high quality magnifier. 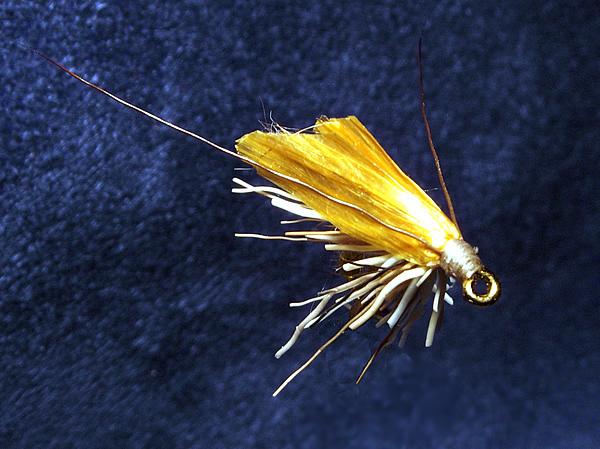 When fishing small nymphs, place the nymph on a dropper, using a buoyant dry fly as your top (indicator) fly, such as a Large Stimulator, an Ausable Wulff or a Chernobyl Ant. In this period, I learnt to like Gudebrod 10/0 (now discontinued) and Benecchi 12/0 thread, and dislike’s Griffith’s for its inconsistency and poor spooling. A hook, hard to find, but great for small flies, is the Daiichi 1640. When I dub on small flies, I usually used Beaver. Thread Midge Larva, using silk thread for the body. For any flash or disco midge, re-enforce with wire. WD-40, a pattern that can easily be adapted. I never tried the snowshoe hare flies, though I wanted to. With respect to dry flies in the book, look to the Olive Biot Dun, a CDC Compardun, and Olive CDC Parachute Dun. I turned the Oddball Quill Gordon into a mini-skater with an oversize saddle hackle and replace the delicate peacock quill with goose biot. Use silk, and consider the salmon fliers trick of having a tinsel underbody. I used these flies, when the fish are finicky. Red Fox Squirrel, at a later date, I will blog my variant. 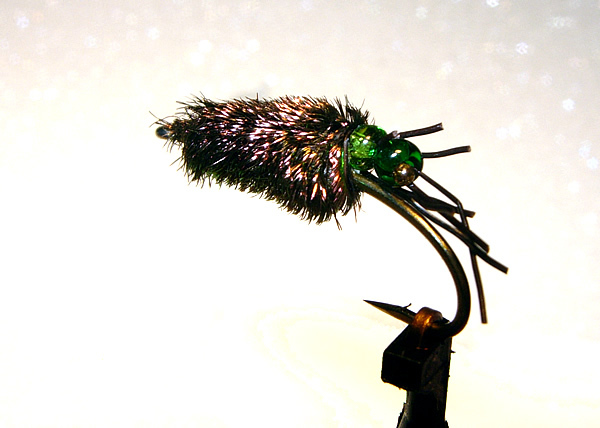 Sparkle Quill Caddis, but try it with a two wire body. Next few weeks, I will highlighting some of my nymph patterns. Weight, heavy … get it to the bottom – of-course! Hook Gap – Maintain a good hook-up. Yes, sharpness counts and go for a turned down eye. But notice, I did not say model-hook size. Often books, tying manuals, refer to a brand, model and size, but does not specify the importance of size as it pertains to the length of the imitation and hook gap. Now add the complications …. Add the complication product lines – come and go – a particular problem with Mustad. A hook model may be excellent at one end of the size scale, but poor at the other. As a hook gets smaller, you want it to be heavier. Mustad hooks can be a mixed bag and add to their constant changing product line, it is difficult to standardize with them on the longterm. Tiemco can be too light on small end, especially if you are after Steelhead. If I need very strong and heavy hooks at the small end, look to Mustad R90 and Daiichi 1520 Wet Fly Hooks. I like Daiichi, but they are not readily available in my stores, so the listing of Tiemco and Mustad is based on availability, and just a suggestion (not an endorsement). Think about body length and the hook gap for the particular imitation you are working. As the fly needs to get larger, look for a long hook and as the fly gets smaller move to a standard length hook. Think of size in terms of body length in mm (in inches). The manufacturers model and size is just a reference number to buy more of the same after you establish what is right and not a good way to define a size of a nymph.